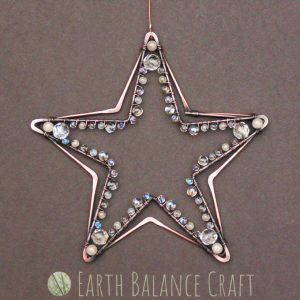 This sparkling crystal sun catcher features two five pointed stars that are linked together and adorned with shimmering clear and white beads. The design is hand-made from copper wire that has been distressed and polished creating metallic highlights and warm coppery tones. To be hung in a window or out in the garden for year round light play as the sun shines through the beads. This decoration would make festive addition to your Christmas home. At the height of summer, pretty butterflies dance around the flowers. This handmade sun catcher design is crafted from copper wire work, gemstones and glass with a fresh palette of aqua, yellow, green and pink. For hanging in the home and garden for year round sparkles of light. Inspired by the soft light cast by the crescent moon at night, this hanging decoration features a muted palette of yellow and cream gemstones and glass. 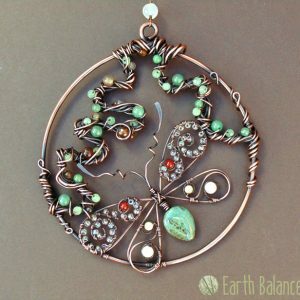 Hand-made with copper wire geometric circles and swirly scrolls that are adorned with translucent beads. Hang in your window for sparkly light play as the sun shines through the beads, or on the wall as decorative art.